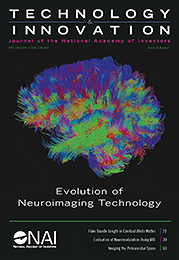 Technology and Innovation, edited and published by the National Academy of Inventors®, is a forum for presenting information encompassing the entire field of applied sciences, with a focus on transformative technology and academic innovation. The journal is dedicated to supporting the NAI’s mission to support and honor academic invention and inventors. The current issue of Technology & Innovation (20.3) seeks to remedy a lack of attention on active support for developing young inventors by focusing on the structure, execution and results of local and national invention education efforts from primary school through higher education. 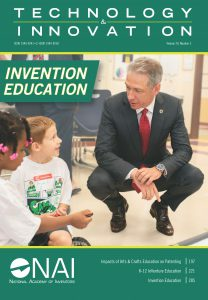 Tampa, Fla. (Apr 1, 2019) – The latest issue of Technology & Innovation (20:3) (full text) seeks to remedy a lack of attention on active support for developing young inventors by focusing on the structure, execution and results of local and national invention education efforts from primary school through higher education. Tampa, Fla. (July 16, 2018) – Special topic issue explores the gender gap between men and women in inventorship, analyzing its causes, evaluating current efforts to address it, and suggesting new ideas to eliminate this disparity. © 2019 The National Academy of Inventors®, Inc. All rights reserved.